Scar endometriosis is a rare entity reported in the gynecological literature, and is present in women who have undergone an abdominal or pelvic operation. The diagnosis of endometriosis is usually established by a biopsy. Because endometriotic lesions can be present as a mass lesion, it seems feasible to investigate them by the non-invasive method of fine needle aspiration cytology (FNAC). We present a case of abdominal wall scar endometriosis in a woman who presented as a tumor on the abdominal wall. She underwent a caesarean section 4 years prior to her presentation. It was a case of endometriosis suspected by FNAC, but confirmation was performed by cell block preparation, and subsequently by histology. A 27-year-old woman presented with a nodule at the lower abdominal caesarean section scar. She had undergone surgery 4 years before. The tumor appeared over the caesarean section scar 4 years after surgery, which gradually increased in size. The patient described cyclical pain at the site of the mass, which coincided with her normal menstrual cycle. She had no previous history of endometriosis. On physical examination, the patient had a firm mass with restricted mobility along the right upper lateral aspect of the caesarean section scar with a black appearance. The mass measured about 5 cm × 5 cm in size and was clinically diagnosed as a tumor on the abdominal wall. It was clinically diagnosed as either metastatic deposit or skin appendage tumor. The patient was found physically fit otherwise. A cell block was made from formalin-fixed sediment. Sections were cut and stained with the hematoxylin - eosin stain. Smear preparation of the FNAC sample showed extensive areas of hemorrhage and scattered small cells with compact nuclei and scanty cytoplasm, resembling stromal cells and columnar epithelial cells, which represented the endometrial glands. Hemosiderin pigment-laden macrophages were also seen [Figure 1]a. The diagnosis given on FNAC was suggestive of scar endometriosis. The cell block findings were confirmatory of endometriosis as they revealed endometrial lining columnar epithelium with subepithelial dense and compact endometrial stroma along with extensive areas of hemorrhage [Figure 1]b.
Histopathological findings after complete excision of the nodule also confirmed endometriosis [Figure 1]c and d.
Endometriosis is defined as the presence of functioning endometrium outside the uterus. The pelvis is the most common site. But, extrapelvic endometriosis is an uncommon disorder. It rarely involves the bladder, kidney, omentum, bowel, lymph node, pleura, umbilicus, hernial sac and abdominal wall. , Endometriosis in an operative scar is also rare. In spite of being relatively common, endometriosis remains a diagnostic and therapeutic enigma even today, largely due to its variable presentations. , Clinically, the features diagnostic of scar endometriosis are lump in the scar, pain, increasing size of lump, bleeding and skin discoloration. , In the literature, the mean size of the masses has been 3.1 cm (range 1.5-4.8 cm). In our case, the size of the mass was 5 cm × 5 cm, which was relatively large and confused with development of tumor on scar endometriosis. Patients may present from months to years (mean 21 months) after their last obstetric/gynecologic surgery. In our case, the patient presented after 4 years of surgery. The skin coloration at the site of endometriosis was black, which may be due to recurrent hemorrhage. The symptoms are non-specific, typically involving abdominal wall pain at the time of menstruation. Clinical examination and other investigations also give non-specific results. In our case, the patient described cyclical pain at the site of the mass, which coincided with her normal menstrual cycle. The diagnosis of endometriosis is usually established by a biopsy. Because endometriotic lesions can present as a mass lesion, it seems feasible to investigate them by the non-invasive method of FNAC. Gupta  also stated that the remaining aspirate was spun and a cell block was made from the sediment and sections cut and stained with hematoxylin-eosin stain. Smear from the abdominal mass shows varying cellularity comprising epithelial and spindle stromal cells, with a variable number of hemosiderin-laden macrophages and inflammatory cells. , The presence of any two of three components (endometrial glands, stomal cells and hemosiderin-laden macrophages) has been used for the cytological diagnosis of endometriosis. , In our case, the cytology smear showed extensive areas of hemorrhage and scattered small cells with compact nuclei and scanty cytoplasm, resembling stromal cells and columnar and hemosiderin pigment-laden macrophages [Figure 1]a. The diagnosis given from FNAC was suggestive of scar endometriosis. Gupta  stated that the FNAC report was further confirmed on examination of cell block, which showed histological features of endometriosis characterized by endometrial glands separated by endometrial stroma and rare siderophages. 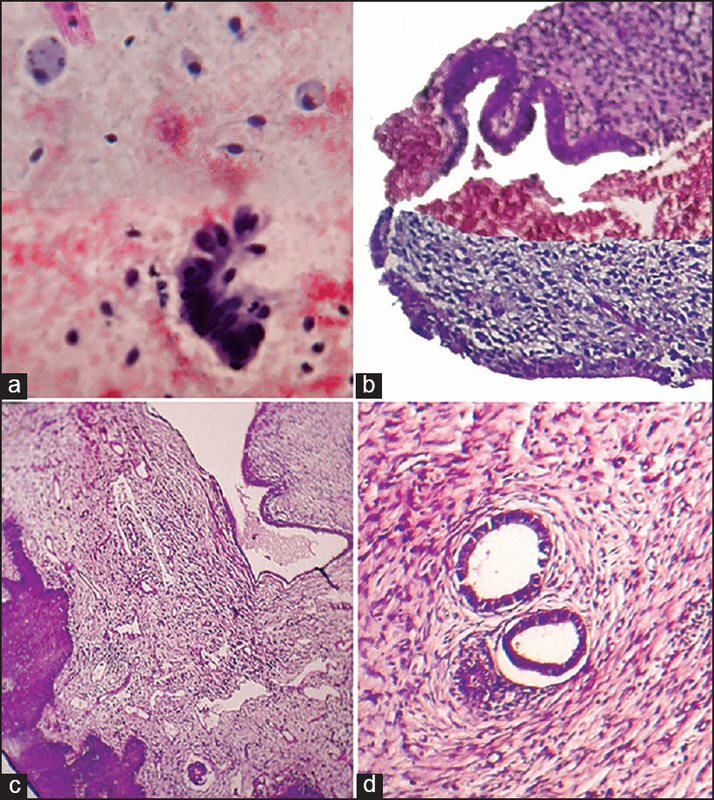 In our case, the cell block findings were confirmatory of endometriosis, as they revealed endometrial columnar epithelium, with subepithelial dense and compact stroma along with extensive areas of hemorrhage [Figure 1]b. Histopathological findings after complete excision of the nodule also confirmed endometriosis [Figure 1]c and d.
In our case, the abdominal wall mass was larger (5 cm × 5 cm) in size and clinically thought to be a metastatic deposit or skin appendage tumor. The history of caesarean section and FNAC from nodule on caesarean scar was suggestive of endometriosis. The additional finding of cell block confirmed the diagnosis of endometriosis. This pre-operative diagnosis facilitated surgical removal of the mass in our case. Therefore, although endometriosis is diagnosed by FNAC, cell block preparation is a good method for the diagnosis of endometriosis before excision of the mass. Danielpour PJ, Layke JC, Durie N, Glickman LT. Scar endometriosis: A rare cause for a painful scar: A case report and review of the literature.Can J PlastSurg 2010;18:9-20. Gupta RK. Fine-needle aspiration cytodiagnosis of endometriosis in caesarean section scar and rectus sheath mass lesions: A study of seven cases. Diagn Cytopathol 2008;36:224-6. Rout N. Cell block-an adjunct to cytodiagnosis. AHRCC Bull 1998;14:21-4. (Personal Communication). Pathan ZA, Dinesh U, Rao R. Scar endometriosis. J Cytol 2010;27:106-8. Goel P, Sood SS, Dalal A; Romilla.Caesarean section endometriosis - Report of two cases. Indian J Med Sci 2005;59:495-8. Sengul I, Sengul D, Kahyaoglu S, Kahyaoglu I. Incisional endometriosis: A report of 3 cases.Can J Surg 2009;52:444-5. Gajjar KB, Mahendru AA, Khaled MA. Caesarean scar endometriosis presenting as an acute abdomen: A case report and review of literature. Arch Gynecol Obstet 2008;277:167-9. Balleyguier C, Chapron C, Chopin N, Hélénon O, Menu Y. Abdominal wall and surgical scar endometriosis: Results of magnetic resonance imaging. Gynecol Obstet Invest 2003;55:220-4. Catalina-Fernández I, López-Presa D, Sáenz-Santamaria J. Fine needle aspiration cytology in cutaneous and subcutaneous endometriosis. Acta Cytol 2007;51:380-4. Pathan SK, Kapila K, Haji BE, Mallik MK, Al-Ansary TA, George SS, et al. Cytomorphological spectrum in scar endometriosis: A study of eight cases. Cytopathology 2005;16:94-9.